The German soprano on her interpretation of the opera, and a role that's complex to act as well as sing. Parsifal is an opera that divides people and there are many layers of metaphor and moral issues within it. What does the opera mean to you? Just like the role of Kundry, the opera itself is also open to many interpretations. My own are not set in concrete. I am always astounded by how varied my own reactions are to the opera each time I re-study it. I think my interpretation has a lot to do with how I am feeling personally at the time, and I don’t expect I’ll ever come to a final version. Isn’t that the definition of great art? At first, I study the role musically, learning notes and text. This gives me the chance to try out various interpretations on my own which I can then bring to the first rehearsals with conductor and producer. My first instrument was the piano, and this allows me to study the role by myself before I work with a coach to sing the part into my voice. We say, 'In den Knocken' – into the bones. During this period, visions of how I want to present my view of the role to conductor, producer and my colleagues begin to form. Of course, any one or all of them together may change any of this completely! Nothing is set in concrete – ever. It’s one of many extreme female characters you have played including Katerina in Lady Macbeth of Mtsensk, Katya Kabanova, Marie in Wozzeck and of course Salome – what draws you to these roles? I have the great fortune and privilege to sing these roles because someone trusted my acting and singing to give them life. In my first engagement at the opera in Ulm I was fortunate to sing roles like Marie in Wozzeck and Montezuma in Wolfgang Rhim’s Die Eroberung Von Mexico, roles that tested me both musically and dramatically. I also had the good fortune to work with excellent producers where I was free to challenge them and they me. It has always been important to me that the stage works hand in hand with the musical side, and that each is able to benefit from the other. That is why I am challenged by the difficult and complex roles I sing in the widest possible way. Do you manage to leave the drama on the stage, or do these big roles stay with you all the time when you are rehearsing and performing them? My private life is wonderfully balanced and very practical. I am supported and loved. This allows me to return relatively easily to my normal, real-life world. For me, it is the key to successful work on the stage: I can immerse myself in a role, understand it and live it - all with enough distance to leave it. 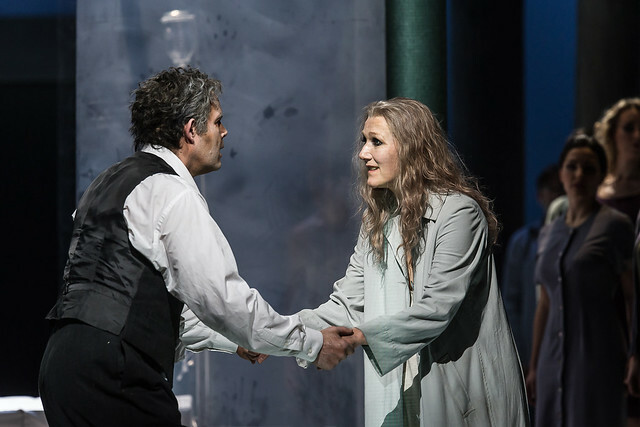 Parsifal runs until 18 December 2013.Tickets are still available. The production will also be relayed live to cinemas around the world on 18 December. Find your nearest cinema and sign up for the cinema newsletter. The production is staged with generous philanthropic support of the Metherell Family, Roland & Sophie Rudd, Dr and Mrs Michael West, Marina Hobson MBE, Ian and Helen Andrews, Peter and Fiona Espenhahn, Annie Frankel, Malcolm Herring, Dr L Mikheev and N Mikheev, Lindsay and Sarah Tomlinson, The Wagner Circle and The Parsifal Production Syndicate and generously supported in memory of Simon Tullah.